Fig. 3. 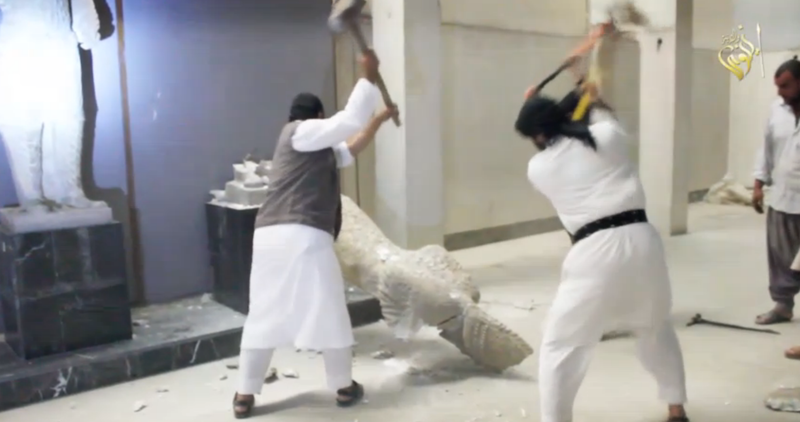 Still from an ISIS video showing the apparent destruction of ancient artifacts at Mosul Museum, February, 2015. Available at Times. While iconoclasm is arguably as old as representation itself, its internal dynamics are historically specific. The destruction of artifacts and/or images that occurs under this designation is not only sanctioned by a shifting set of belief systems and cultural conditions, but so too is it circumscribed by specific modes of representation and technologies.1 Approaching recent events in Mosul with this recognition in mind serves to connect these performances to larger questions regarding the media environment in which these acts took place. It also opens the prospect of reverse engineering these displays so that they might divulge the complex network of forces, both cultural and technological, that undergird their operation. This project requires reevaluating two primary assumptions that structure our everyday understanding of iconoclasm: first, that iconoclasm functions as an originary act that takes place independently of the media by which it is made available to its audience; and second, that iconoclasm is solely an operation of negation or erasure. Reconsidering these assumptions not only excavates the power relations behind contemporary acts of iconoclasm, it also serves to acknowledge a dynamic symmetry between the destruction of artifacts by extremist groups such as ISIS and similar actions by the U.S. military in the region. In this context, the commemorative function of the monument, let alone its sheer visibility, proves capable of working through a reversal of presence whereby disappearance no longer proves synonymous with forgetting or loss, but rather forms the condition of possibility for a specific mode of image production. In light of this reversal, it no longer suffices to speak of monuments as casualties of war or revolution. As Robert S. Nelson and Margaret Olin describe, once the monument’s “potential for destruction or defacement” begins to function as “the most meaningful aspect of the monument’s existence as an object,” then its destruction becomes its realization, its primary means of signifying.3 The Futurists were perhaps the first to recognize this shift. Describing the “inauguration of the monument” as a “rendezvous of uncontrollable hilarity,” the artist Umberto Boccioni understood the significance of these sites solely in terms of their destruction. In freeing the present of the burden of the past, these acts of destruction were intended to elevate the experience of the monument to the level of art and in the process re-invite these sites to once again participate in history. The reaction of Iraqi dissident Kanan Makiya (also known by the pseudonym, Samir al-Khalil) to the unveiling of Saddam Hussein’s Victory Arch in 1989 confirms this relation. Upon encountering the work, al-Khalil is prompted to contemplate not the victory over Iran that the site commemorates, but rather the moment when the statue will be torn down in the same way the statues of King Faisal and General Maude had been before it. One only has to look at the back history of larger-than-life media stagings of monument death that have worked their way into collective imaginary (the destruction of Dzerinsky’s statue, the Berlin Wall, and even the World Trade Center) to find the historical roots of this peculiar reversal whereby eradication becomes the primary means for a monument or artifact to take place. This interchangeability of presence and absence is a symptom of modern media’s penchant for the spectacular. Through an alliance with media, the duality of iconoclasm—its tendency to produce images in the process of destroying them—is amplified such that the ubiquity, endless reach, and temporal instantaneity of media networks grant the monument the capacity to achieve an extraordinary, if only momentary, (negative) presence. Fig. 1. The toppling of the statue of Saddam Hussein in Firdos Square, Iraq, April 9, 2003. Available at Viscultblog. Fig. 2. Still from an ISIS video showing the apparent destruction of ancient artifacts at Mosul Museum, February, 2015. Available at Vice. The events in Mosul clearly exemplify iconoclasm’s recent shift of emphasis from artifact to image. They would also seem to indicate a dwindling significance of the target’s status as original in this media-dependent configuration. However, a closer look at the intricacies of this particular staging calls this latter point into question. Mainstream media accounts have largely ignored the fact that the spectacle of destruction that took place in front of the camera was accompanied by more localized performances in which the originals were publicly escorted out-of-frame, so to speak. As Arif Hamdan, a history teacher in Mosul, explains, the people of the city were made aware that not only had the statues been taken to Syria (others have suggested they were taken to the Baghdad museum), but that manufactured copies had subsequently been shipped to the museum in Mosul not long after. As Hamdan explains, these “counterfeit statues” came from the Wadi Iqab neighborhood where they were “confiscat[ed] from one of the shops in the industrial area where many artifacts are being manufactured.”7 For those residents privy to the truth about the spectacle in the museum, the original continued to operate as the centerpiece of meaning, albeit from a safe distance. Utilizing the contrast between this highly localized narrative and the global narrative that quickly took shape, the performance attempted to forge subjectivity around a kind of oppositional group identification. These tensions between local and global networks were placed in the service of what Carl Schmitt described as the “friend-foe” distinction such that “Muslim” identity would in large measure be defined by its distinction from a Western, non-Muslim other.8 It seems reasonable to conclude that it is this attempt at the creation of a singular and coherent collectivity that was the goal of this performance as much as the endangerment or destruction of the region’s artifacts. Such a conceit is made possible by iconoclasm’s incestuous relationship to the image. After all, it is the deployment of video and the layering effect that it produced between audiences that allowed the ambiguity of the original to be put to ideological work, despite being out of view. After being destroyed, many monuments and artifacts take on another life through representations. Disappearance no longer proves synonymous with forgetting or loss, but rather forms the condition of possibility for a specific mode of image production. Cite this piece as Thomas Stubblefield, “Iconoclasm beyond Negation: Globalization and Image Production in Mosul” The Aggregate website (Transparent Peer Reviewed), Volume 3, December 12, 2016. Accessed April 21, 2019, http://we-aggregate.org/piece/iconoclasm-beyond-negation-globalization-and-image-production-in-mosul. For a discussion of the way in which the theological base of spectacle and iconoclasm morphs into the secular context of late capitalism, see Marie-José Mondzain’s work Image, Icon, Economy: The Byzantine Origins of the Contemporary Imaginary (Stanford: Stanford University Press, 2006). W. J. T. Mitchell, Cloning Terror: The War of Images, 9/11 to the Present (Chicago: University of Chicago Press, 2011), 3. Richard S. Nelson and Margaret Olin, Monuments and Memory, Made and Unmade (Chicago: University of Chicago Press, 2003), 205. Harry Harootunian, “Remembering the Historical Present,” Critical Inquiry 33.3 (Spring 2007): 475. I discuss the events of Firdos Square in greater detail in chapter four of my book, 9/11 and the Visual Culture of Disaster (Bloomington, IN: Indiana University Press, 2015). David Zucchino, “Army Stage-Managed Fall of Hussein Statue,” Los Angeles Times, July 3, 2004. Sarbaz Yusuf, “ISIS Transferred Original Monuments Abroad, Destroyed Fake Ones in Mosul Video,” ARA News, March 4, 2015, accessed September 2, 2016, http://rt.com/news/240801-isis-destroy-statues-fake/. Carl Schmitt, The Concept of the Political, trans. George Schwab (Chicago: University of Chicago Press, 2007).